This Wifi b/g wireless IP camera has its own built in web server. You can view the video from your own home network or you can configure your router to view and control the camera from computers or cellphones on the internet, without dependence on any third party web sites or subscriptions. With the built-in microphone you can listen in. Excellent MPEG4 or MJPEG video quality at a full 640 x 480 resolution with up to 30 frames per second for fluid, natural motion color. For viewing or recording a single camera no software is required besides just your browser. For viewing or recording multiple Sharx IP cameras the included MultiView software for PCs supports up to 4 Sharx IP cameras simultaneously. Truly amazing to see the streaming video on your web enabled cell phone. For frequent use we recommend to upgrade your cellphone service to unlimited data, which costs just $15/mo extra on the ATT network. You can see motion even on non-3G phones like SonyEricsson w580i. If your phone does not support video you can see automatically refreshing JPEG images. At home, you can use this camera with your laptop or iPhone as a baby or pet monitor, and the very high light sensitivity in "moonlight mode" allows you to view out from a window to see what's happening in the street as long as there is some background light available. This camera has infrared night vision which can see in total, absolute darkness. Like any infrared sensitive camera, the daytime colors are subdued and can appear unnatural especially on plants and vegetation. For eye-popping, gorgeous daytime colors please select the less expensive Sharx SCNC2606 camera if you do not need night vision in total darkness. Wireless operation supports WEP, WPA, WPA2 encryption. On routers with UPnP feature the camera can set itself up automatically, and on routers without UPnP (such as Apple's Airport series) the camera can be set up with our step by step instructions. Discontinued model, the replacement is the Sharx Security SCNC2900W which adds high-definition video, better daytime colors, better night vision, and adds Windows 8.1 and Mac OSX Mavericks compatibility. This Wifi b/g wireless IP camera has its own built in web server. You can view the video from your own home network or you can configure your router to view and control the camera from computers or cellphones on the internet, without dependence on any third party web sites or subscriptions. With the built-in microphone you can listen in. Excellent MPEG4 or MJPEG video quality at a full 640 x 480 resolution with up to 30 frames per second for fluid, natural motion color. For viewing or recording a single camera no software is required besides just your browser. For viewing or recording multiple Sharx IP cameras the included MultiView software for PCs supports up to 4 Sharx IP cameras simultaneously. Truly amazing to see the streaming video on your web enabled cell phone. For frequent use we recommend to upgrade your cellphone service to unlimited data, which costs just $15/mo extra on the ATT network. You can see motion even on non-3G phones like SonyEricsson w580i. If your phone does not support video you can see automatically refreshing JPEG images. At home, you can use this camera with your laptop or iPhone as a baby or pet monitor, and the very high light sensitivity in "moonlight mode" allows you to view out from a window to see what's happening in the street as long as there is some background light available. For night vision in absolute, total darkness with no visible light, upgrade to SCNC2607 which adds infrared night vision and a higher quality, wide angle lens. Wireless operation supports WEP, WPA, WPA2 encryption. On routers with UPnP feature the camera can set itself up automatically, and on routers without UPnP (such as Apple's Airport series) the camera can be set up with our step by step instructions. Q: IP address does not show up on program tool "IP Camera Tool"
A: Make sure the camera and PC are within the same subnet, disable MAC filter on your router, and add the camera to white list to be found on the network. Q: Cannot set up DDNS domain/ wireless connection. A: Please always feel free to contact support at hootoo dot com for help, we answer most emails within 24hr. It combines a high quality color camera with the flexibility of remote pan / tilt operations through operator control. The movability of the camera enables it to cover a wide field of view. The built-in audio support enables remote users to not only view, but also listen in on an area and communicate orders or requests to visitors or intruders, thereby increasing the monitoring options. Pre- and post-alarm image buffering, video motion detection, scheduled and triggered event functionality with alarm notification together with two-way audio makes the HT-IP206 ideal for remotely monitoring people and property. 8-LEDs night vision for image down to 0.5lux, brand new look with a detachable crystal dome so you can always make sure the camera body or image sensor get no stain on it, the dome can also be removed at any time as per your needs, install in up in the ceiling to enjoy the look of a cute jellyfish camera. This network camera is designed for use in mid-sized businesses, such as retail stores and supermarkets, transmitting images over the local area network or the Internet. Use Dropcam Echo to see and hear what you're missing while away from home! With your laptop or mobile phone you can view and listen to the Dropcam, and alerts let you know when there's motion. Dropcam Echo is a small, wi-fi enabled video security camera (IP camera) with audio. You can also use Dropcam's cloud DVR to make sure your video is safely stored off-site - you'll never have to worry about lost tapes or theft. Everyone has something to watch, and Dropcam helps you see what you're missing from anywhere! The world's easiest setup - no computer necessary! Get audio and motion-triggered alerts sent to your mobile phone or email - instantly! 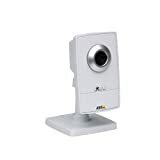 Archerfish Solo is an all-in-one video surveillance system: outdoor/indoor 802.11 wireless camera, DVR, Intelligent Surveillance Technology, and a personal web portal for online system management and 24/7 viewing of live and recorded video for free from any computer. It's different from other video surveillance systems because it understands what it sees. You tell Archerfish what to detect and what to ignore, so you only get mobile alerts that are important to you. No more wasted hours watching empty scenes or meaningless motion alerts. When it comes to watching over your home, business and family, don't settle for anything less than Archerfish. Intelligent Surveillance Technology, newer than motion detection, alerts on specific activities - like a person, car, or other objects - not just motion. Reduces false alerts. Three video options include: live, recorded (DVR), and customizable alerts. View live and DVR video online for free from any computer. Mobile access to video available for iPhone, iPod Touch or Android devices. System expands to unlimited number of Archerfish cameras in one or more locations, managed from a single online account. No software needed to operate. 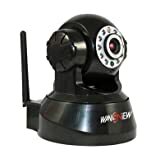 Indoor/outdoor, low light, color, 802.11b/g wireless camera measuring just 4.5" high with built-in Intelligent Surveillance Technology and DVR (2GB microSD card included, expandable to 32GB). H.264 compression with choice of CIF or VGA resolution. All-in-one system, with automatic tamper detection, just needs broadband Internet service and wireless router to work. Use Dropcam as a baby monitor to watch your kids, as a pet cam to make sure your dog and cat are behaving, or as a security camera to keep an eye on your stuff. Everyone has something to watch, and Dropcam helps you see what you're missing from anywhere! The Dropcam is a small wi-fi enabled video security camera (IP camera). Keep an eye on your stuff with your computer at work, your laptop while at a coffee shop, or even an iPhone while on the road! Dropcam also provides an Internet DVR so you can go back and review what happened, and you'll never have to worry about losing tapes or theft. Get motion-triggered alerts sent to your mobile phone or email - instantly! The installation of network cameras is very simple, only power and networks connection are needed. Scope of applications: apply to home, offices, enterprises, supermarkets, schools and other public places. Supporting multiple protocols: Embedded operation system supports the TCP / IP, SMTP (simple mail protocol), HTTP, UPNP, etc. Alarm Monitoring: Through external alarm device, the alarm information can be sent to your e-box or your mobile phone. Outdoor Waterproof Wireless/wired Ip Camera with Night Vision and Motion Detection Alarm, Apple Mac and Windows compatible, Silver. Wordpress theme developed by Simpler Computing and others - Wordpress and WPMU Plugins, custom code and more.